Ragweed (Ambrosia), also called bitterweed is a genus from the Asteraceae (sunflower) family of plants. There are 41 species of ragweed worldwide, with Common Ragweed (Ambrosia artemisifolia) as the most common. 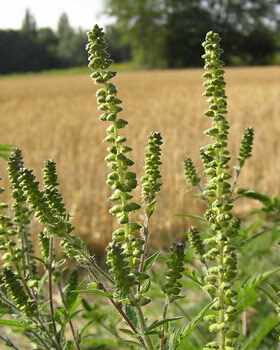 Common Ragweed and Western Ragweed (Ambrosia psilostachya) are highly allergenic and the most common cause of hay fever. Each plant produces about a billion grains of pollen in one season, which are transferred by wind. Ragweed mainly grows in temperate parts of the Northern Hemisphere, and also South America. In the Northern Hemisphere it begins to bloom in early July and lasts until mid-August. 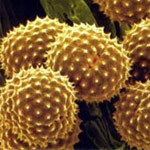 The pollen counts are high from mid-August until the first frost, peaking from mid-September to mid-October. Near the plants, the pollen counts are the highest shortly after dawn. Rheumatism is an umbrella term for a variety of conditions and disorders characterized by problems with joints and connective tissue and associated with stiffness, pain and limitation of movement. There are many different kinds of rheumatism with different causes. Arthritis is one of the many forms. Weather sensitivity is very common among rheumatology patients. Various symptoms, including most prominently the pain, usually worsen during (or shortly before) cold and damp weather. A diet rich in omega-3 fatty acids (n-3 fatty acids) is very important for people who suffer from rheumatism. These unsaturated fatty acids can be found in cold water fish, such as salmon, herring, sardines, anchovies, or tuna (though in smaller amounts). Green-lipped mussel (Perna canaliculus) from New Zealand and krill are also excellent sources. Chia sage (Salvia hispanica), flax seeds (or linseed oil), kiwi fruit, and the perilla herb are also rich in omega-3 fatty acids. A rhizome is a horizontal stem of an underground plant. Rhizomes are also called rootstocks, or creeping rootstalks. The rhizomes of some plants grow above ground, or lie at the soil surface. Breaking a rhizome into pieces, each piece may be able to form a new plant. This kind of vegetative (asexual) reproduction is typically used to propagate ginger, asparagus, hops, irises and some orchids. Rhinorrhea or runny nose is a symptom of an infection in the nasal cavity, or an allergic reaction, such as hay fever. A runny nose sometimes leads to a stuffy nose. In case the runny nose is caused by an inflammation, most of the suggested treatments for a common cough would also benefit the nasal cavity. Chamomile tea has anti-inflammatory and anti-histamine properties and will also give your immune system a boost. Neti pots are one of the most effective preventive methods, as they rinse away the allergens with saltwater. To use a neti pot, stir ¼ to ½ a teaspoon of noniodized table salt into a cup of lukewarm water. 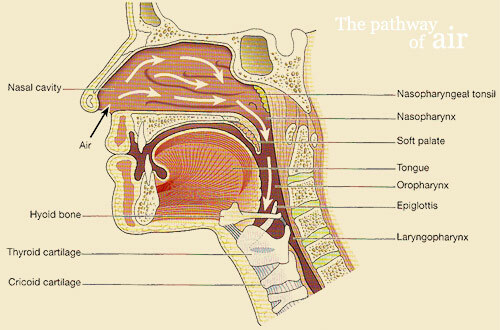 The mixture is poured into one nostril and drained out the other nostril. You can experiment with the amount of salt per water. Peel a small piece of ginger and chew on it. Swallow the juices. You can also dip the ginger in honey before you place it in your mouth.